Health campaigns warning of the dangers of alcohol are being ignored by many young people who see binge drinking as acceptable, researchers say. A study by Birmingham and Bath universities suggests the government must stop "demonising" young people in its attempts to promote safe drinking. Researchers interviewed 89 people in England aged 18-25 over three years. They say ministers will have to look again at health campaigns if they are to have any kind of significant impact. Funded by the Economic and Social Research Council, the study concluded young people did not see their own drinking cultures reflected in adverts which took a negative stance. It said warnings not to drink more than two or three units of alcohol day are seen as unrealistic by many 18 to 25-year-olds. The young people did, however, identify with adverts which promoted alcohol as a fun, social habit. The project found that alcohol played a significant part in forming a "group identity" and that drinking and alcohol-related stories played an "important role" in binding different social groups together. Professor Christian Griffin, who led the research team, said the government had to take action. She said: "Top of my list would have to be to stop demonising and making generalisations about young people and their drinking. We also need to listen and incorporate their views and perspectives." The researchers carried out in-depth interviews for The Young People and Alcohol project in three unidentified locations in England. These included a major city centre in the Midlands with a diverse population, a seaside town, and a small market town in the West Country with a more homogenous population and fewer places to drink. It focused on how adverts and other marketing practices shaped people's attitudes to drinking and included the analysis of 216 alcohol adverts, both in print and broadcast form. The team found that educational adverts which often advocated "safe levels" of alcohol consumption, such as this year's Home Office £4m anti-binge-drinking campaign, were viewed as "laughably unrealistic". The TV images showed young people injuring themselves, being violent and smearing vomit in their hair. However, adverts which highlighted that drinking was a "cool" habit and a form of "calculated hedonism" did appeal to and influence the audience. The researchers noted that participants discussed the harm, risks and pleasures of drinking but this was set firmly within a culture of "drinking to excess", which they described as a form of "fun". Professor Isabelle Szmigin, who assisted the study, told the BBC: "For young people, drinking is very much a part of their social life but we feel that a lot of the government literature tends to present a picture of it being an individual responsibility rather than a social one. "Young people do engage with the idea of responsible drinking but far more from the social side. They ensure there are designated drivers; people looking out for each other and that their friends are safe." Don Shenker, the chief executive of the charity Alcohol Concern, said new campaigns were needed to highlight the more immediate possible consequences of drinking too much. "The type of messages around drinking for young people need to be much more focused on the short-term aspects - things like being a victim of a crime, ending up in hospital due to intoxication, the way that alcohol affects your looks for example," he said. 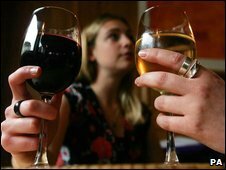 The government has said the aim of its recent campaign against binge drinking was to encourage people to "think twice about the serious consequences".